Long before the area was called home by white settlers, the site of what would become Coffeyville was occupied by the Black Dog band of Osage Indians who roamed this part of Kansas and northern Oklahoma, hunting buffalo. At an early period in Montgomery County history, several attempts were made to establish a town in the southeastern part of the county, nearly all of which failed. The first attempt was made in 1869, when a town called Clymore, named in honor of an Indian chief by that name, sprang into existence, but was primarily composed only of Lushbaugh's trading store. I. C. Crawford and Eli Dennis, in the spring of 1869, laid out a town a mile or so south of Clymore, which they christened Westralia. This image available for photographic prints HERE! These places, however, would soon give way under the absorbing influence of a town founded by Colonel James A. Coffey and N. B. Blanton in 1869. Colonel Coffee original established a trading post at the site, which thrived, exchanging supplies with the Osage and Cherokee Indians. Situated on what is now South Walnut Street, a small settlement grew up around the trading post on the west bank of the Verdigris River, but grew very slowly during its first few years. About a mile and a half south of Westralia, on the east side of the Verdigris River, another settlement called Parker was started about the same time, by D.T. Parker, H. W. Martin and others. The town was designed to be the southern terminus of the Leavenworth, Lawrence & Galveston Railroad. Parker grew quickly, within a year supporting more than 1,000 inhabitants. However, the railroad decided to cross the Verdigris River at a point a few miles above Parker, and the flourishing settlement was doomed. In the meantime, Coffeyville, which had not flourished, was chosen as the railroad’s terminus, and guaranteed its success. Within no time, buildings and homes were moved from Parker to Coffeyville, leaving the former town abandoned. After structures were moved, and others dismantled for supplies, only two or three buildings remained in Parker. What little was left was washed away by a flood of the Verdigris River soon afterwards. The first town site of Coffeyville was established about a mile south of the center of present day Coffeyville, just about one and half miles from the north line of the Indian Territory. Situated so close to the border of Indian Territory and on the cattle trail, much disorder prevailed in the small settlement, so much so that the main thoroughfare took the name "Red Hot Street," and crime and murder were a common occurrence. Despite its wild manner, the first school was conducted in 1869 in Colonel Coffey's house and taught by his daughter, Mary. That same year, the Methodist Church began in a building at Tenth and Elm Street which is the present site of the church. The first public tax supported school began in 1870 in a building on Walnut. When the terminus Kansas City, Lawrence & Southern Kansas Railroad was established in 1871, most of the businesses of the original settlement moved a mile north and the former town site then took on the nickname of “old town.” A post office was first established at "Old" Coffeyville, in September, 1871, with Colonel Coffey as its first postmaster. In the spring of 1872, however, it was moved to the new town site and S.B. Hickman became the postmaster. The new town site of Coffeyville then became the terminus of the southern cattle drive, to which immense herds of cattle were driven from Indian Territory and Texas for shipment by rail to Eastern markets. This not only stimulated the businesses of the city, but also earned the status of yet another lawless Kansas cow town. With the large numbers and character of its fluctuating population, the town was wild with excitement, and society was a chaos. The reckless cowboy knew no restraint, gamblers plied their avocation openly, and saloons were quick to ply their customers with liquor. The streets resounded with the rattle of beer glasses and the clicking's of the keno and billiard rooms; quarrels were frequent, and the reports of the pistol, announcing that some unfortunate man had fallen victim to the well aimed instrument, were common; dance halls, filled with lewd women lined the streets. Gambling became so common, and of such a nature, as to become a nuisance, so much so, that, that Coffeyville Mayor, A. B. Clark, instructed the police officers to invade the gambling dens and arrest the offenders. However, when the offenders were taken before the judge, he was surprised to find before him, the majority of the city council. 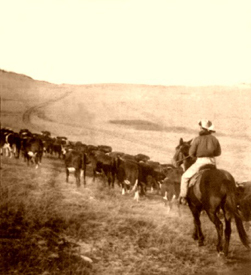 Because of the cattle drives, the town grew quickly but many law abiding and peace loving settlers avoided the lawless cow town. However, that changed as the terminus of the railroad moved further west and the reckless cowboys found a new cow town to haunt. Soon, society became organized and settled, and law abiding citizens moved to the city, which soon supported about 1,500 residents. In February, 1872, the town was organized and incorporated. The Coffeyville Journal was established in October, 1875 and the St. Paul’s Episcopal Church was completed in the spring of 1879. Before long, other congregations, including those for African-Americans, also were organized. The first bank was established in May, 1880 by T. G. Ayres and Samuel Steel, called the First National Bank. Legends' Photo Blog - Follow our travels as we make our way across America finding bunches of out of the way places, legends, historic sites, ghost towns, and great photo opportunities. Here, is where you'll also get a more personal view of our travels -- from the many great folks we meet, to what we think about the places we visit, and, of course, hundreds of photos & slideshows that we hope you enjoy. While Legends of America is our Go To site for history, facts, and information; our Photo Blog is our first stop in developing these many articles, where you'll find more personal information, and reviews of the places we visit.